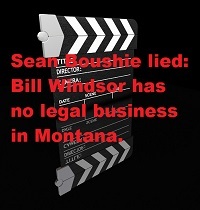 On August 13, 2013, Sean Boushie signed a sworn affidavit before a notary, and he swore that Bill Windsor had no legal business in Montana. The false sworn affidavit was used to get William M. Windsor arrested and jailed for 134 days. CRIMINAL CHARGE AGAINST SEAN BOUSHIE: On August 13, 2013, Sean Boushie signed a sworn affidavit before a notary public as part of his Petition for Temporary Order of Protection. In the sworn affidavit (page 3), he stated that Bill Windsor had no legal business in Montana. He lied about this so that he could claim that Bill Windsor's purpose in coming to Missoula Montana was to "stalk, threaten, harass, and intimidate me in person." Sean Boushie followed the Lawless America Movie for 20 months. He knew for many months that Bill Windsor would be there filming. Bill Windsor's legal business and Constitutionally-protected right was to film a segment for the Lawless America Movie as well as the pilot for a proposed weekly television series. There are at least a dozen articles that were published about this during the year prior to the Missoula filming. Bill Windsor was registered with the Montana Film Commission. He was approved for filming by the University of Montana. He kept the University of Montana Police informed about his filming plans. And he was approved by the City of Missoula to film anywhere in the city on public property. Sean B**shie was also well aware that Bill Windsor was in Missoula to take his deposition and his wife's deposition in a civil matter. They failed to appear for their depositions. Sean B**shie was also fully aware that Bill Windsor was in Montana to report him to law enforcement and to attempt to obtain an order of protection as Georgia told him that he would have to file for protection in Montana. This is all documented in a published article. (c) the statement is one that is required by law to be sworn or affirmed before a notary or other person authorized to administer oaths. (2) Subsections (4) through (7) of 45-7-201 apply to this section. (3) Except as provided in 13-35-240, a person convicted of false swearing shall be fined an amount not to exceed $500 or be imprisoned in the county jail for a term not to exceed 6 months, or both. 45-7-201. Perjury. (1) A person commits the offense of perjury if in any official proceeding the person knowingly makes a false statement under oath or equivalent affirmation or swears or affirms the truth of a statement previously made when the statement is material. (2) A person convicted of perjury shall be punished by imprisonment in the state prison for any term not to exceed 10 years or be punished by a fine of not more than $50,000, or both. (3) Falsification is material, regardless of the admissibility of the statement under rules of evidence, if it could have affected the course or outcome of the proceeding. It is no defense that the declarant mistakenly believed the falsification to be immaterial. Whether a falsification is material in a given factual situation is a question of law. (4) It is not a defense to prosecution under this section that the oath or affirmation was administered or taken in an irregular manner or that the declarant was not competent to make the statement. A document purporting to be made upon oath or affirmation at any time when the offender presents it as being so verified must be considered to have been sworn or affirmed. (5) A person may not be guilty of an offense under this section if the person retracted the falsification in the course of the proceeding in which it was made before it became manifest that the falsification was or would be exposed and before the falsification substantially affected the proceeding. (6) When the defendant made inconsistent statements under oath or equivalent affirmation, both having been made within the period of the statute of limitations, the prosecution may proceed by setting forth the inconsistent statements in a single count alleging in the alternative that one or the other was false and not believed by the defendant. In that case, it is not necessary for the prosecution to prove which statement was false but only that one or the other was false and not believed by the defendant to be true. (7) A person may not be convicted of an offense under this section when proof of falsity rests solely upon the testimony of a single person other than the defendant. 1. Ask any of thousands of people who read LawlessAmerica.com and the Lawless America Facebook Page about Bill Windsor's legal business in Montana. Review LawlessAmerica.com articles from February 2012 through August 23, 2013. Be in the movie or on the TV show. 2. Review Bill Windsor's correspondence with the Montana Film Commission. 3. Review Bill Windsor's correspondence with the University of Montana. 5. Review the law enforcement reports filed by William M. Windsor. Ravalli County Sheriff's Department -- Stevensville Police Department -- Missoula Police Department -- University of Montana Police Department -- FBI. 6. Review the petitions for temporary order of protection filed by William M. Windsor -- Ravalli County Justice Court -- Ravalli County District Court -- Missoula Municipal Court -- Missoula County District Court.